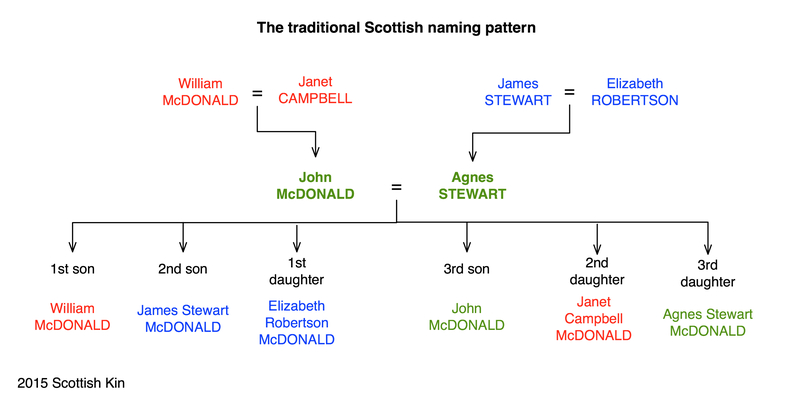 Have you ever wondered why so many people in your Scottish family history research have the same first name? Or why so many middle names look like surnames? It could be thanks to the traditional Scottish naming pattern. The third son is named after the father. The third daughter is named after the mother. So John and Robert McDonald, sons of William and Janet, would both name their eldest son William McDonald. And their second daughters would each be named Janet McDonald. Surnames were quite frequently used as middle names, including the grandmothers’ maiden surnames. The tradition meant that cousins often had the same name, making following them through census records a little trickier, especially in a close knit community – you need to make sure that the record is for the correct William McDonald for example. You may also find that a name was “re-used” if a child died young, so in later years it may seem as though the names are out of order. The system can help to prioritise your genealogical research when you have more than one set of potential grandparents and limited time. Start with the grandparents with similar names to the couple's children. It's not infallible (family feuds have always been with us, after all, meaning that a couple might have chosen not to honour a particular member of the family) and of course, couples didn’t always follow this tradition. But it does mean that you have a lead to possible grandparents’ names when you have the details of a couple’s children – and vice versa. 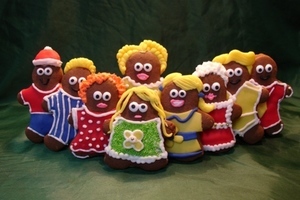 Glaikit: Silly, foolish or thoughtless, pronounced ‘glaykit’.